Want to get seriously savvy with your business accounting, but don’t know where to start? You don’t need to be a professional accountant to decode the jargon. Use these pointers to find out how to make sense of your accounts, balance your budgets, and boost your profit margin. Six main groups are intimately connected to the life of a business. Knowing who they are, what they expect and how you’re interacting with each of them is essential. Customers, who buy the products and services that the business sells. Employees, who provide services to the business; they are paid wages and salaries and are provided with a broad range of benefits such as a pension plan and paid holidays. Suppliers and vendors, who sell a wide range of things to the business such as legal advice, electricity and gas, telephone service, computers, vehicles, tools and equipment, furniture and even audits. Debt sources of capital, who loan money to the business, charge interest on the amount loaned and have to be repaid at specific dates in the future. Equity sources of capital, the individuals and financial institutions including private equity firms who invest money in the business and expect the business to earn profit on the capital they have invested. Government agencies that collect income taxes, payroll taxes, value-added tax and excise duties from the business, or who provide support and grants to encourage business expansion and international trade. As someone concerned with business accounting, you have a lot to know and to remember. To help you, this list explains the main tasks and processes. Payroll: Based on several collections of data: detailed private information in personnel files and earnings-to-date information, the correct amounts of income tax and social security tax. Several other deductions from wages also have to be calculated. NI contributions, PAYE payments, retirement and holiday pay have to be updated every pay period. Cash inflows: All cash received from sales and all other sources has to be carefully identified and recorded, not only in the cash account but also in the appropriate account for the source of the received cash. Cash payments: In addition to payroll cheques, a business writes many other cheques during the course of a year to pay for a wide variety of items including local business taxes, paying off loans and the distribution of some of its profit to the business owners. Purchases and stock: Accounting departments are usually responsible for keeping track of all purchase orders that have been placed for stock (products to be sold by the business) and all other assets and services that the business buys. The accounting department also keeps detailed records on all products held for sale by the business and, when the products are sold, records the cost of the goods sold. Capital accounting: A typical business holds many different assets called capital, including office furniture and equipment, retail display cabinets, computers, machinery and tools, vehicles, buildings and land. Apart from relatively small-cost items, a business has to maintain detailed records of its capital items, both for controlling the use of the assets and for determining taxes. Balance sheet: A summary of the business’s financial position at the end of the accounting period. Profit and loss account: A summary of sales revenue and expenses that determines the profit (or loss) for the period that has just ended. The profit and loss account also summarises the outflow of assets for expenses during the period leading down to the well-known bottom line, or final profit, or loss, for the period. Cash flow statement: The cash flow statement summarises the business’s cash inflows and outflows during the period. The first part of this statement calculates the net increase or decrease in cash during the period from the profit-making activities that are reported in the profit and loss account. 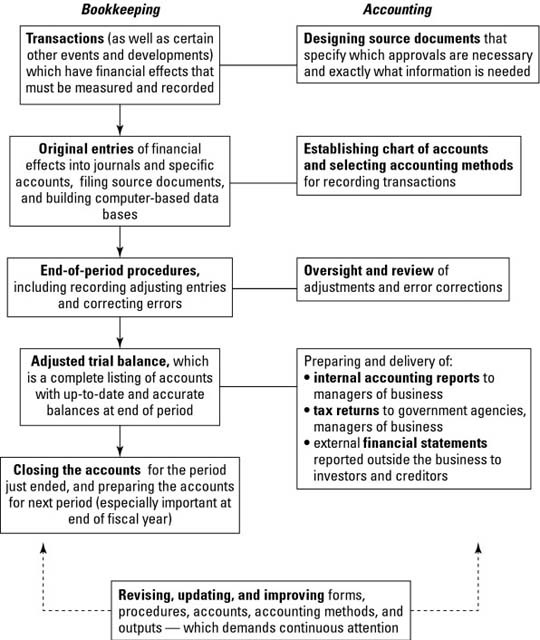 This flowchart gives an overview of the business accounting cycle, mapping the entire bookkeeping process with aspects of the accounting system side-by-side. The bookkeeping stages are on the left-hand side and the respective accounting processes are on the right.